"Elated by this Elijah" was the verdict given by the JEP's columnist Rod McLoughlin in his review (below) of the concert on the 15th of May. Elijah is one of those works that can seize an audience and hold it spellbound for more than two hours – at its Birmingham premiere in 1846 The Times went to town. 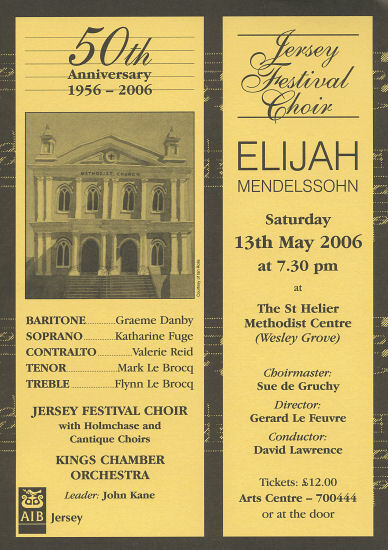 I’m pleased to report that something of that euphoria was generated at Wesley Grove on Saturday evening after the Jersey Festival Choir’s 50th anniversary performance. 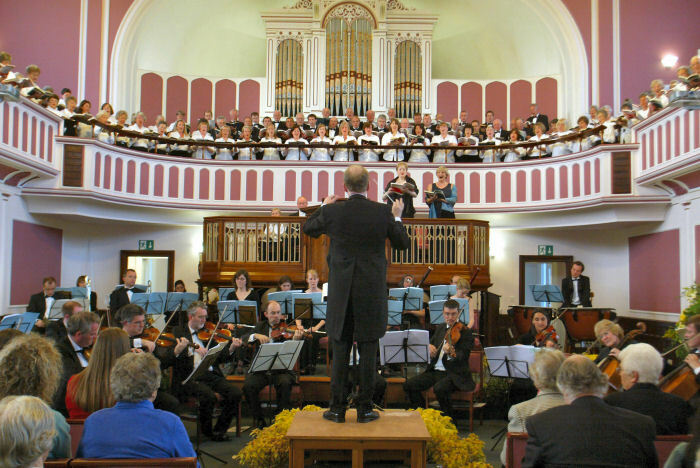 If JEP reviewers are generally more cautious these days than they were in 1956 when the choir’s inaugural Messiah was described as “the most outstanding musical occasion in memory”, I will happily say that this was an uplifting evening. 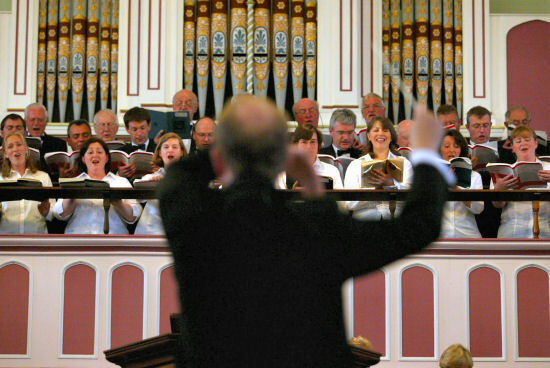 You could tell halfway into the Overture, when conductor David Lawrence suddenly kicked at the accelerator to propel the King’s Chamber Orchestra towards the wall of choral sound that is the opening chorus ‘Help, Lord! Wilt Thou quite destroy us’ that it was going to be something special. Mendelssohn’s portrayal of the Hebrew prophet is above all else a drama – the relationship between the Old Testament God, the prophet Elijah, a backsliding people and their false gods brought to life vividly in a series of episodes distinguished by their melodic invention. The ‘drama’ comes from the relationship of the quartet of principals and the chorus which variously takes on the roles of the backsliders, narrator, the idolatrous Priests of Baal, and the Angels. I use the word ‘drama’ not in a purely figurative way because this performance did manage to suggest an excitement and physicality that operates at furthest extent of a conventional oratorio. There was, for instance, some very interesting chemistry between the soloists, not only an excellent quartet of voices but also masters of the principle that stillness and control produce a disproportionate expressive intensity. So, for instance, the interaction of Katherine Fuge’s widow, whose dying son is brought back from the grave, and Elijah, sung by the outstanding Graeme Danby, was transfixing. If a performance has this degree of impassioned restraint generally, the rare moments where that reserve is temporarily relaxed can be startling. Mendelssohn provides musical excitement at the point where Elijah shows himself to Ahab but the appearance of tenor Mark Le Brocq through the rear doors of the church, he and Elijah pointing accusing fingers at each across the divide, was truly seismic in its impact. You held onto your seat – perhaps recalling Michelangelo’s depiction of the creation from the roof of the Sistine Chapel – lest the energy passing between the fingers should threaten the very foundations of Wesley Grove. The power was similar, at the other end of the emotional range, when the boy - sung with great confidence and control by Flynn Le Brocq – points towards the sky to herald the return of the rains to the parched land and the vindication of God’s master-plan. For those moments alone - with Graeme Danby’s subtle interaction with the chorus, exhorting them to try to sing louder in a fruitless attempt to galvanise their god Baal into action - you would have parted with the price of your ticket and gone home overjoyed. The Festival Choir, schooled by Sue de Gruchy and bolstered by the Holmchase and Cantique singers, deserve special mention for their efforts to respond to the narrative. Given a sniff of blood – or perhaps something to mock at, a mighty fury or the occasional false prophet to seize and slaughter – and they were away, delighting in the possibilities of blood-letting that the Old Testament affords. Left to their own devices the Holmchase Choir are evidently a more peaceable lot. Their angelic solo ‘Lift thine eyes’, following another especially moving transition involving Graeme Danby and Mark Le Brocq, was another highlight. And Gerard Le Feuvre’s admirable King’s Chamber Orchestra were terrific partners with some especially responsive flute and oboe solos supporting the more restrained moments in the score. However, I struggled to contain myself – and I think the same might be said for the conductor, too – at that moment just before the end of part one in the great chorus ‘Thanks be to God’ when the strings, having accompanied the full choir for a couple of pages, are given two and a half bars of totally exposed descending semi-quavers leading to the final fortissimo entry by the choir. Wow - thrilling! From its pinnacle in the Victorian period, Elijah’s popularity has taken something of a fall - perhaps writing like the chorus ‘Be not afraid’ seems rather mawkish these days. A performance like this one reinforces just what an experience can provide. You left wishing that it was on for a second night to hear it all over again.